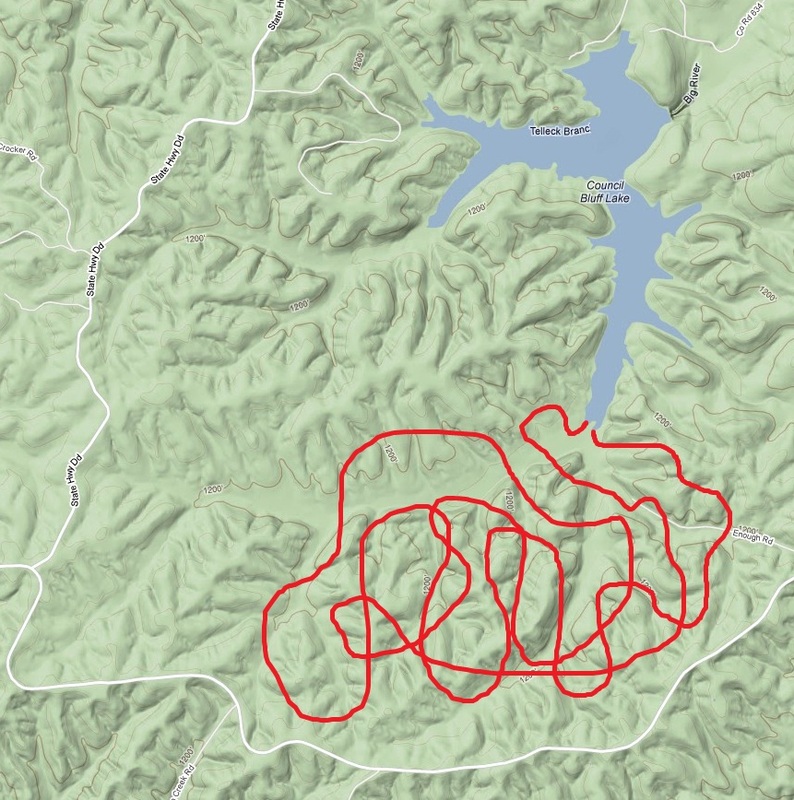 I'm attempting my first "AR double" this month by racing two 24hr events in back-to-back weekends, so there isn't much time to pump out a blog post for the first race before lining up for the second. So here's a somewhat detailed report but mostly a summary of our race at Berryman. Andrei rolls into St. Louis on Thursday night and on Friday morning we take our time packing the car for the trip down to Bass Resort near Steelville, MO where the race check-in, meal, and meeting will be held. We get to Bass right as check-in is opening at 3pm and quickly collect our packets. Then, it's time to nap and wait for the better half of our team to arrive from Minnesota. I'm super pumped to race with Erl and Biz. They get to Bass just in time for the pre-race dinner and catching up with AR buddies from Bushwhacker and Alpine Shop. 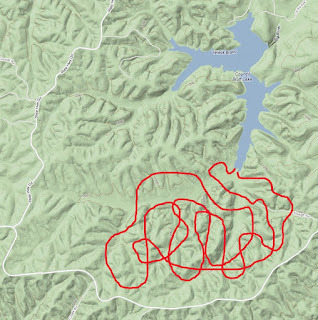 At the pre-race meeting, we receive 1 map (1:24k USGS) and coordinates for 46 CPs (everything up to the BIKE 3). Then we head to the Super8 in Potosi to plot and pack for the race. Judging from the maps, we make the decision to use race-provided canoe paddles instead of our personal kayak paddles so we won't have to carry them all through the race. Canoe paddles are slower, but we think that the minutes gained by using kayak paddles on the water will be less than the minutes lost assembling/disassembling/packing/carrying them for the rest of the race. Biz, Erl, and Dre at race check-in. How can you NOT be excited to race with these guys?! On race morning, everything goes smoothly getting out of the hotel. We decide to leave the kayak paddles in our hotel room to avoid second-guessing ourselves at the start. 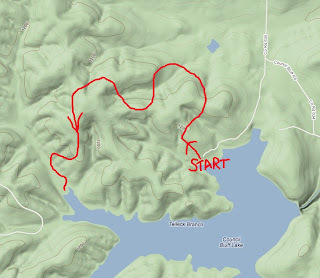 I make the first nav error of the day (always nice to get that out of the way) on the drive to the bike drop at the Wild Boar Boat Launch of Council Bluff Lake. But once we're there, Erl and Biz build their bikes in a flash (they were both INSIDE a Honda Civic) and we hustle over to the start line at the Council Bluff Lake Pavilion. As everyone is assembling in the minutes before 8am, Gary the race director announces that personal paddles may be left at the end of PADDLE 1 and retrieved after the race, instead of requiring teams to carry them throughout the race. Huge bummer for us! But, there's nothing we can do about it now, so we just vow to paddle like rabid hamsters and try to keep up with the rest of the field. Pre-race chat. Notice my matching headband. So stylish. Somewhere on that red line there were some checkpoints. Go! We start off with a Bonk Hard-signature uphill run to the first CP. I am punching, Biz is on the map, and Erl and Dre are running hard. We started with the 12-hour teams as well so it's fun running with a whole bunch of people through the woods. We have a slight bobble on one of the controls but nothing major and arrive at the TA in 3rd place, neck-and-neck with Kuat. Kuat transitions swiftly and, with their kayak paddles, are quickly in front of us, chasing after Bushwhacker who is in the lead. We are in third and I'm paddling in front with Biz in the back of one boat; Andrei is in the front of Erl's boat. Biz quickly establishes a lightning-fast paddling cadence in an effort to minimize damage from the other teams' faster paddles. Council Bluff Lake was created by a dam, and for some reason much of the forest was left standing (instead of being logged before flooding) so there are old trees sticking up everywhere. We have to pay really close attention when near the shoreline to avoid capsizing. But fortunately Biz is an excellent paddler so we take the best possible lines through the tree slalom on our way to collecting the 5 CPs. Alpine Shop and former Bonk Hard owners We're Kind Of A Big Deal pass us on this section, so we come back to the boat launch in 5th place. Coming into the take-out in 5th place. Post-race illustration of BIKE 1. We did not have this map during the race. 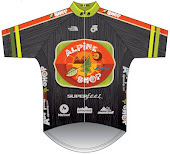 But, we have a speedy transition and pass Alpine Shop in TA! 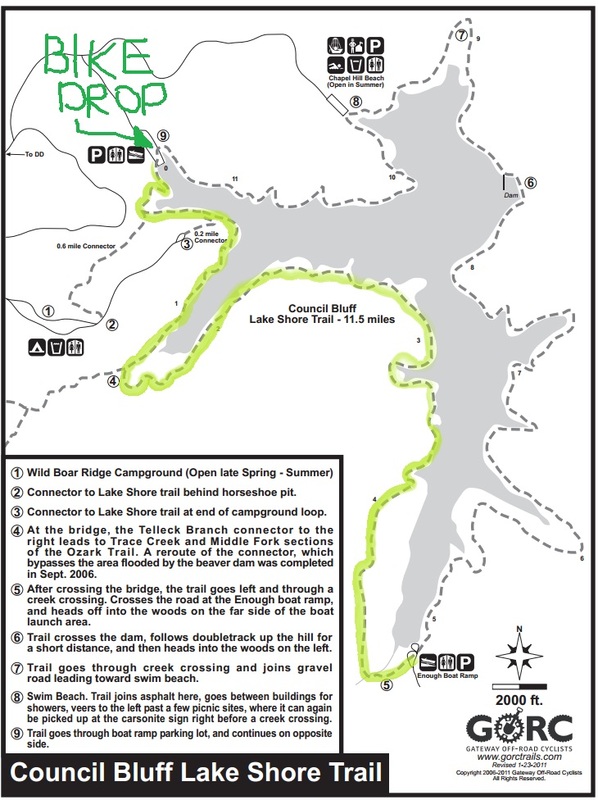 It's onto the singletrack loop surrounding Council Bluff Lake and we know their technical mtb skills are no match for ours. Soon enough, they are asking for a spot to pass and we happily let them by. Biz and Dre are rocking skinny tires and they are crushing the techy singletrack - nice job boys!! 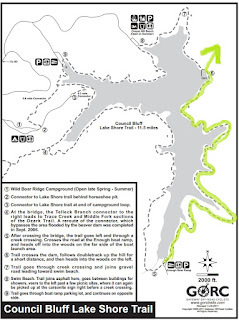 We make it through the singletrack in one piece and arrive at Enough Boat Ramp to start a big trek, again almost even with Alpine Shop but still behind Kuat and Bushwhacker. Artist's representation of TREK 2. Not to scale. Or accurate in any way besides start/end points. We estimate that this trek will take us about 4 hours so we make sure everyone has enough calories and then hit the woods. Dre is on the maps here and Biz takes the opportunity to snap awesome photos of the team looking exhausted. And of me kissing turtles we find in the woods. It's about 11am when we start so we are trekking in the hottest part of the race - it's sunny and maybe 80F. For the first couple CPs we are with Alpine Shop, then we move ahead and catch Bushwhacker for a couple CPs, then we lose everyone and cruise through the woods alone. Except, it's not so cruisy when we hit a patch of dense underbrush that forces us all to crawl. We have some confusion with areas that have been logged and trails not matching up exactly on the map, so Dre and Biz work together to relocate the team and get to the next CP. I'm basically focusing on staying hydrated and moving through the thorns. I am sort of a wimp when it comes to thorns so it's a good thing I'm getting a lot of practice at them today! At one point I get completely caught up in them and Erl has to push/spin me through that patch. Biz is out of water and the rest of us are almost dry, but every creek bed we come to holds only gravel. After about an hour of sharing water, we finally find a spring-fed stream and take time to fill everyone's bladders and soak our shirts. We are like a new team after getting some fluids and finish the trek solidly. We get back to TA at Enough Boat Ramp a little behind schedule, but happy that we worked together and solved some problems out there. We check in with the volunteers and our happiness soon turns to despair - Bushwhacker CRUSHED the trek in 4ish hours (compared to our 5ish) and we are now in 2nd place, about 60 minutes behind them. We still have a good amount of racing left to do but Bushwhacker is a fast all-around team and it's going to be really hard to catch them. But, we won't know unless we try, so we transition and start chasing. First part of BIKE 2. We did not hav this map during the race. The first part of our chase is more Council Bluff singletrack, this time on the eastern portion of the lake. We get in a pretty good groove and soon pop out at the dam. 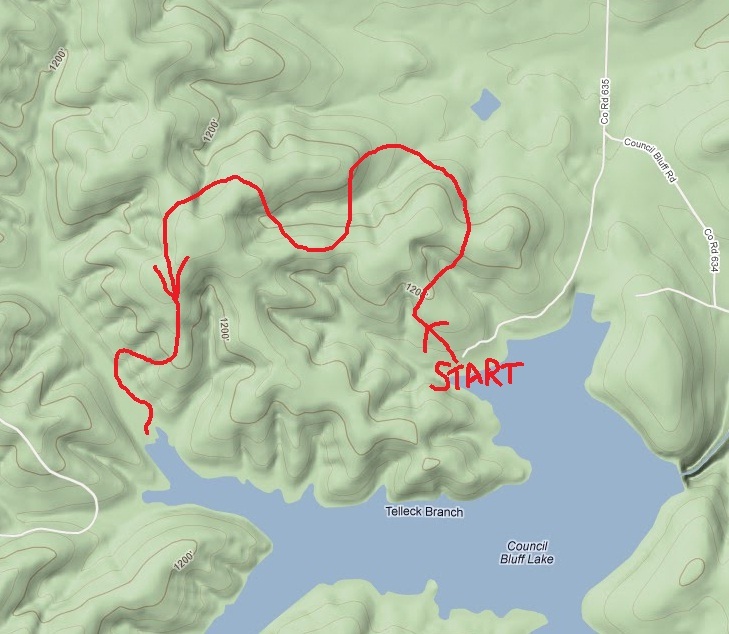 Our Plan A was to bikewhack down the dam but there isn't any good footing to be seen, so we take Plan B - a doubletrack around-route and hit the country roads. 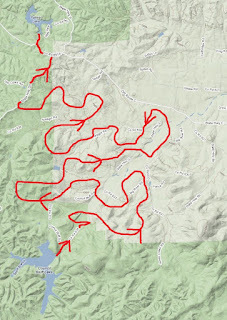 Artist's representation of the road riding on BIKE 2. They are a mixture of gravel and pavement. We organize into a paceline when we can with Biz leading the charge. Dre's rear derailleur is acting up and his bike is ghost-shifting every 5-10 seconds. Not good! But Dre puts up with this major annoyance and the rest of us try to keep him in the middle of the draft whenever we can. 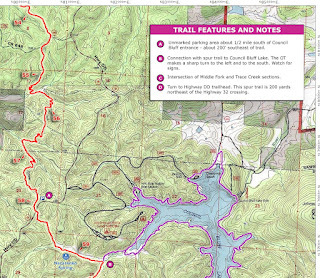 We are determined to cut into Bushwhacker's gap and push as hard as we can on this section. I get a major boost when 2 cars pass us on Hwy DD and they belong to my friends Ryan and Hunter. I sprint off the front of our group (I'm sure the boys thought I was being crazy) and try to chase the cars down. It would have been hard except there is a stop sign and the cars wait for me. I breathlessly chat with Hunter for a few seconds before my teammates roll up and we have to continue our chase. But I am grinning - adventure racing is hardly a spectator sport so it's just really cool when to see non-racing people you know out on the course. 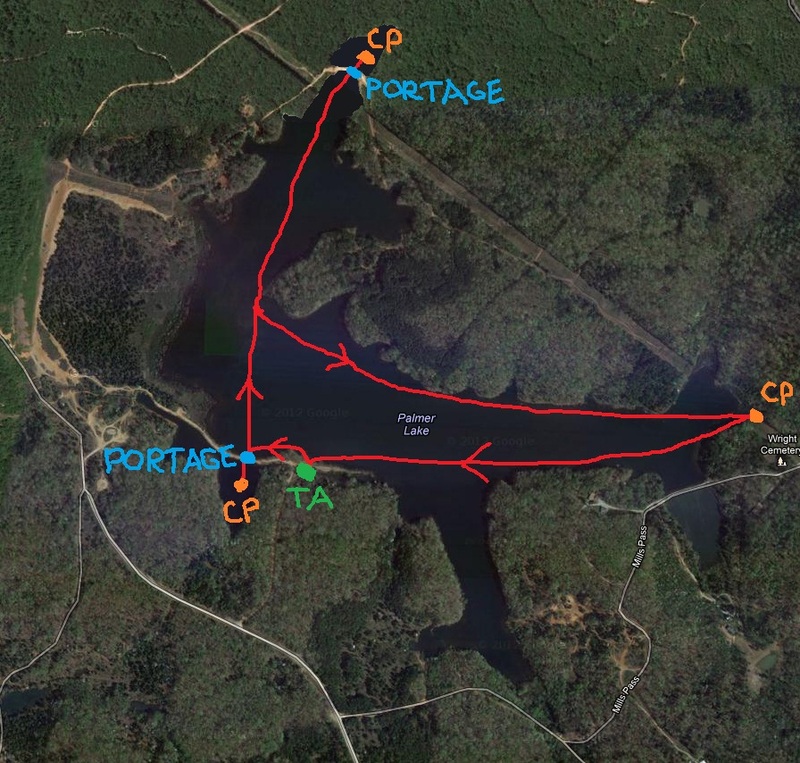 Approximate map of PADDLE 2. Can't really remember the CP numbers. We arrive at the put-in and are greeting by race volunteer Emma from Orange Lederhosen! It's another friendly face and she has good news - we are now only 45 minutes behind Bushwhacker. We are stoked to hear that we made up 15 minutes on the bike! Bushwhacker is still out on the water. So we again fly through transition and start paddling like mad. 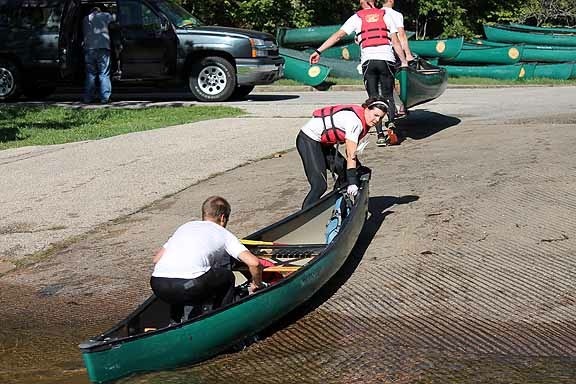 The first CP is in a pond behind a sand berm so we have to portage one canoe up and over. I have the punchcard so it's me and Biz who do the grunt work. Once we punch the first CP, we pass Bushwhacker (they went in opposite order as us). In some sports, this encounter would be frosty and uncomfortable. Not so in AR. We are cheering for their awesome trek, and they are cheering for us to keep racing strong. This is an amazing sport. Our second CP has the same portage deal and we keep the same arrangement. Then it's a quick paddle to collect the third and last CP. Back at TA, we see the bikes of Alpine Shop, another reminder that any mistake will not only cost us a chance to catch Bushwhacker, it will also probably bump us out of 2nd place. Tense stuff!! But we remind ourselves to RACE OUR OWN RACE and get going on the bikes about 7:10pm. This leg is all that stands between us and our gear drop bags so we are super motivated finish it and get access to extra calories and water. I struggle here a little so Erl gives me some pushes on the pavement and Biz gives me a tow up a massive gravel hill. Dre's bike seems to have miraculously fixed its shifting issues so we are managing to move well as a team. We have to turn on our lights for this section since the sun is setting. 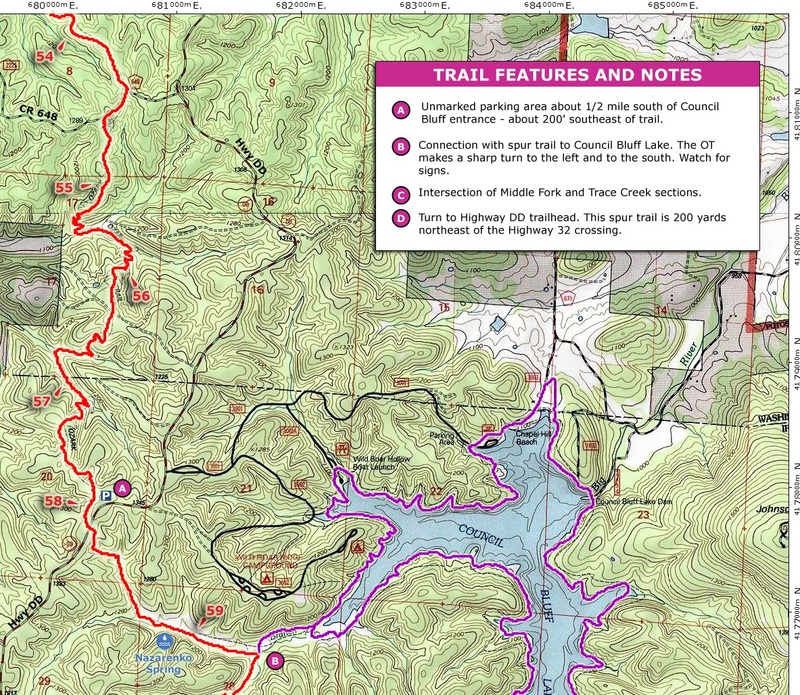 We get to ride some parts of the Ozark Trail which is awesome, it's definitely in need of TLC but pretty rideable, and I always like meeting new singletrack. Biz leads us on a cool bikewhack and pretty soon we are rolling into TA, which is a key spot in the race. We don't know anything about the remainder of the race - this TA will give us information about the distances and disciplines remaining. Also, we learn that Bushwhacker left 10-15 minutes ago after a 30 minute TA. So that means we have gained a couple minutes on them from the previous bike and we will gain more if we can transition quickly. We have a lot to accomplish though - Biz and I plot 10 new trekking CPs, and Erl and Dre fill bladders with water and packs with calories. We all eat a ton - Erl made everyone sandwiches before the race and they are DELICIOUS. I have two, plus a Coke. We knock all of our tasks out in 15 minutes and hit the woods for a crucial night rogaine. Biz is leading the charge and we are all feeling pretty good after the information and calories we took on in TA. Honestly I don't remember much about this trek except...Biz nailing the navigation, Dre running hard for the punches, me drinking a Monster and feeling total body rejuvenation, and Erl carrying like 10 empty bottles of Coke in his pack that we all drank. We cross paths with Bushwhacker about half-way through the trek. Evidently they chose the same order as us, so we are still behind but we tell ourselves that we are gaining ground. This is confirmed when we see Kuat on the way to our last CP - they whoop it up for us and tell us that Bushwhacker is only 6 minutes ahead. Super motivating. We get back to the TA after completing the loop and Bushwhacker is still there. THIS IS A BARN BURNER!!! The volunteer gives us more CPs to plot which describe the remainder of the race - all that's left is a bike and a paddle. This is actually bad news for us, because it means we will have to gain the lead plus a time cushion on the next bike if we are to have any chance of holding Bushwhacker's kayak paddles off on the final paddling leg. We roll out of TA on a mission. It's gonna be tough but we have to try and catch Bushwhacker NOW. 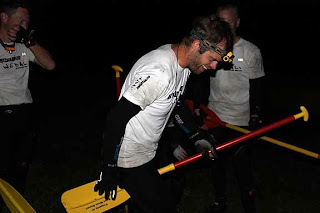 Except, a few minutes out of TA, we realize that we don't have our glowsticks with us, which are mandatory gear for any paddling leg. Crap. Do we continue and ask to use our bike blinky lights as replacements and risk getting disqualified? Do we return to the TA and hope we can find them in our gear drop bags? Every second counts and after a little bit of discussion, we decide to return to the TA and hope our glowsticks are still there. We fly back to TA and I start frantically digging through our gear bags which the volunteers thankfully have not thrown away yet. BINGO. Four glowsticks are innocently sitting there. I grab them, stuff them in Biz's pack, and we roar out of the TA for the second time. The rest of the bike is again a haze for me - it's pedalpedalpedal, don't crash, keep drinking water, pedalpedalpedal. We pass Bushwhacker near the first CP on this leg, I think it's CP33, one that is located a little off trail so we all get to trek in our bike shoes, always a joy. After that CP we are too scared to look back, plus the OT takes all of our concentration to not crash. The route takes us to a connector trail and then we ride clockwise on the Council Bluff singletrack back to the same boat launch as PADDLE 1. We have a small time gap on Bushwhacker, but who knows if it will be enough to hold them off on this final leg. 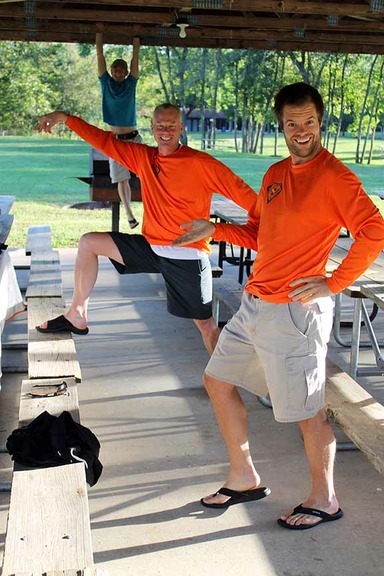 We don't even change out of our biking gear before jumping in the boats, we've got to MOVE! Now our focus is paddlepaddlepaddle, and I am channeling every rabid hamster thought I can think of to make my cadence faster. As we shove off from the dock, we see Bushwhacker's lights roll into TA, meaning our gap is 5-10 minutes, depending on how fast they can transition. Oh, and remember those stumps from earlier today? They're still there, lurking beneath the lake surface, only now it's completely dark AND the lake is steaming so headlamps do almost no good. There's not much we can do except KEEP PADDLING. I try to call out stumps when I see them but more than once they rub under the boat and threaten to capsize us. Dre and Erl have the punchcard now so Biz is navigating, steering our boat, telling them where to go, and still reminding me to extend my reach and keep a good cadence. And trying to win the race with four kayak paddles breathing down our necks. At times I am hunched over completely in the front of the boat, trying to spot stumps through the steam and still paddle like mad - it is full-on RACING. We navigate everything really clean and pretty soon it's time to turn towards the finish line. There are some lights in the far distance but we can't tell what they belong to...fishing boats? A campsite? The finish line? Our minds are completely useless to make sense of it all at this point in the race so we just keep paddling on the correct compass bearing and hope that we don't hear any boat noises behind us. Or run into any stumps. As we get closer to the lights, we are convinced that they are fishing boats and we still have a ways to go. But then we get closer. And closer. And we see the lights illuminating the Bonk Hard inflatable arch. And no teams in front of us or behind us. And then we hear cowbells and know that we have arrived! All that's left is to carry the boats and all our gear up the short hill to the finish line. 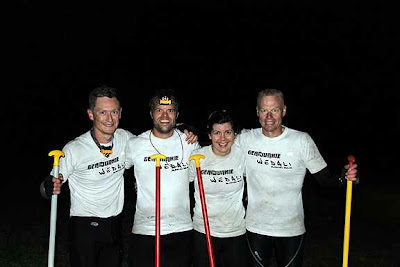 This portage is really painful but completely worth it to be able to celebrate winning the 2012 Bonk Hard Berryman Adventure! Andrei, Biz, me, Erl at the finish line! We are ecstatic. We take some finish line pictures with the plastic canoe paddles, now embracing the gear that caused us so much stress during the race. It's an amazing feeling - chasing down a talented team like Bushwhacker and them squeaking out the win is a tall order and GearJunkie/WEDALI rose to the challenge. After the adrenaline of the finish line wears off, I start to shiver really badly so I throw on my duck suit and wait for Bushwhacker to arrive. It's 2am and cold out there - we didn't notice it on the lake because we were too frantic but now it's very uncomfortable! Fortunately, Bushwhacker is only minutes behind us and we give them a cowbell greeting and major congratulations. After they are in, I change into dry clothes, eat some finish line food, and both teams hang out a bit around the fire with Gary, Ellen, and the finish line volunteers. About 3am, we decide to go back to Potosi for a hotel room shower and a small nap before returning for the 9am awards ceremony and the drive home. This race experience for me was just incredible. I had a couple of personal goals that I wanted accomplish to improve my performance from Thunder - eating more and taking better care of my feet - and I accomplished both. 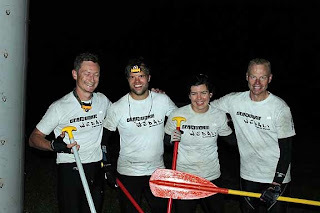 But the team's accomplishments are much more dramatic - not freaking out at the paddle issue, staying calm/focused/positive when we learned we were way behind, working together to move through the course quickly, helping each other in transition, and trusting each others' decisions with navigation and race logistics. I am so lucky to be teamed up with three awesome guys - Biz, Erl, and Dre...you are amazing and I am so proud of our race. 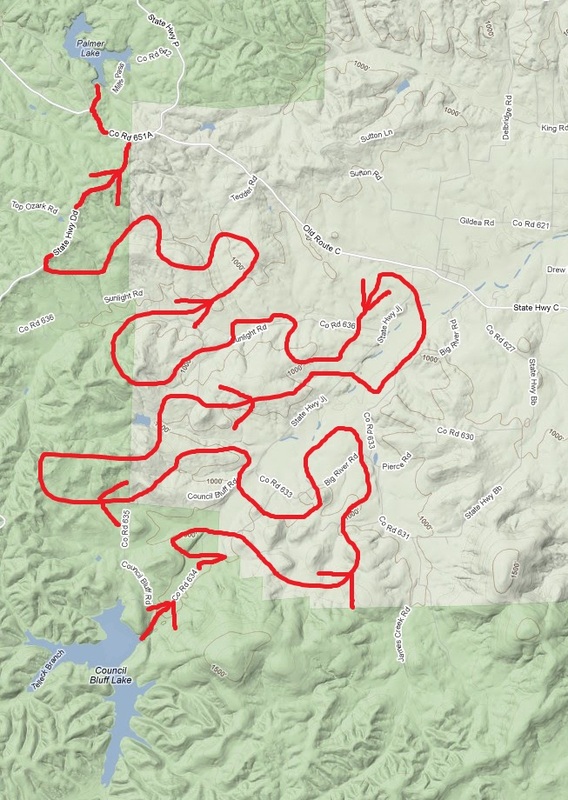 I love reading your race reports - between hanging out with Bushwhackers at Untamed and getting to vicariously experienced the Bonkhard races through your write-ups, I feel like I'm getting outside of my east coast AR bubble! And more to the point, nice work on the win! Awesome race, and great race report. While I'm plenty accustomed to finishing towards the back at races, it's pretty rare for me to get crushed like this in the race report race. :) and you manage to cover everything! BTW, that was my son at the canoe beach with Emma. He got a great look at AR, and now he's talking about racing.